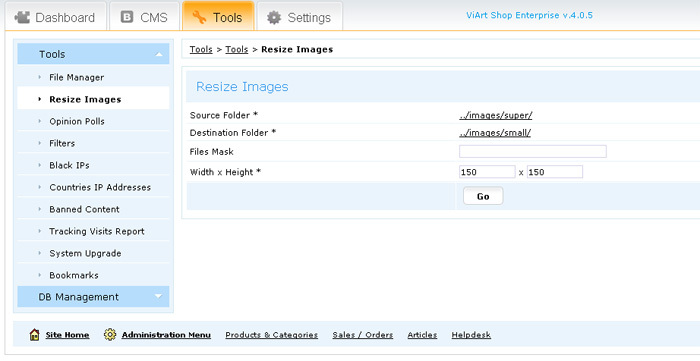 Resize Images tool is available under Tools tab in admin panel. Source Folder - where you need to select the folder with original images. Destination Folder - the folder where the resized images will be saved. * - any number of characters.
? - any single character. name. * - (images with specified "name" but of any format) name.jpg, name.png, name.jpeg, name.gif etc. name* - (images that start from specified "name") name123.jpg, nameabcde.gif, nameoo12_1.jpeg etc. ???. * - (images with only three letters and any extension) abc.gif, akn.png, 123.jpeg, l89.jpg etc. on?.jpg - (images with only three letters name, starting from specified two letters "on" and with jpg extension) one.jpg, on1.jpg, on6.jpg, onh.jpg etc. Width x Height - the size of new converted images.